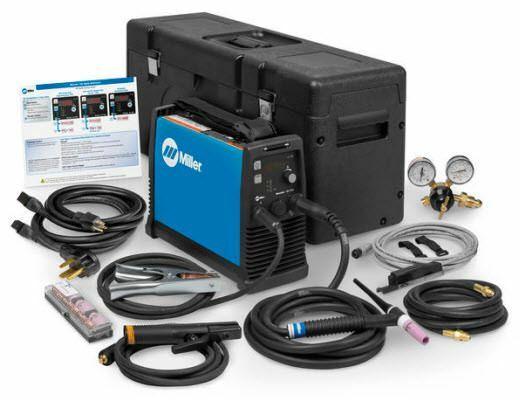 Miller Maxstar® 161 STL TIG/Stick package with remote control comes complete with 150 amp TIG torch, RCCS-6M fingertip remote amperage control, TIG accessories, flow gauge regulator, gas hose, stick electrode holder, power cables and X-CASE. It is capable of up to 160 amps of DC welding output. It weighs only 13 pounds and operates on either 120 volt or 240 input power. The Maxstar 161 STL features Miller's Lift-Arc™, which initiates the TIG welding arc without using high frequency. The TIG arc is struck when the tungsten electrode is lifted off of the weld piece. The Maxstar 161 STL also offers superior stick arc performance, even when using E6010. It has Miller's Auto-Line™ technology that automatically adjusts for input voltages ranging from 120 volts to 240 volts without manual linking. The Maxstar 161 STL comes with Miller's True Blue® 3 year warranty. Auto-Line™ - Allows for any input voltage hookup (120 - 240 V) with no manual linking, providing convenience in any job setting. Ideal solution for dirty or unreliable power. Digital meter for more precise control when presetting or monitoring welding amperage. Lift-Arc™ provides TIG arc initiation without the use of high frequency. Built-in gas solenoid eliminates the need for a bulky torch with a gas valve. Portable in the shop or at the job site - at 13.2 lb the shoulder strap allows the end user to easily move from location to location. Fan-On-Demand™ - power source cooling system operates only when needed, reducing noise, energy use and the amount of contaminants pulled through the machine. Thermal overload protection - helps prevent machine damage if the duty cycle is exceeded or airflow is blocked. Single amperage range - allows operator to accurately set amperage on both 120 or 240 volt primary power. Hot Start™ adaptive control - provides positive arc starts without sticking. Low OCV stick is a simple design that reduces the open circuit voltage to 12 - 16 volts when the welding power source is not in use. This circuit design is now built into the Maxstar 161 S eliminating the need for add-on voltage reducers. Power factor corrected (PFC) - for optimum performance especially on 120 volts - reduces nuisance breaker tripping. Stick-Stuck detects if the electrode is stuck to the part and turns the welding output off to safely and easily remove the electrode. Menu selectable. Superior stick arc performance even on the difficult-to-run electrodes like E6010. NOTE: This is a DC welder ONLY. It CANNOT weld aluminum. 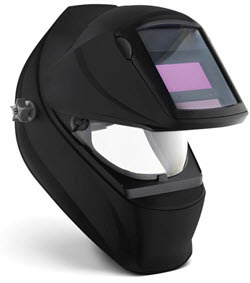 FREE Miller® Classic VSi Black auto-darkening welding hood. PLUS get a $100 Build With Blue™ Cash Rebate from Miller® with the purchase of a Maxstar® 161 welder AND get up to an additional $200 Cash Rebate when you purchase qualifying Miller® or Hobart® branded accessories (excludes welders and plasma cutters). Download Build With Blue™ Rebate Submission Instructions HERE. All rebate forms MUST be submitted electronically to Miller no later than July 15, 2019. Offer expires 6/30/19. Miller® RFCS-6M remote amperage foot control with 6-pin plug. 20 Cubic Foot Inert Gas Cylinder for Argon(75%)/CO2(25%), Argon or Nitrogen. is there any TIG machine that can be adapted to run a spool gun? What's the difference between the maxstar 150? The Maxstar 161 STL has a digital meter for more precise control when presetting or monitoring welding amperage, it has Stick-Stuck which detects if the electrode is stuck to the part and turns the welding output off to safely and easily remove the electrode, it comes with 6.5 ft 120-volt and 240-volt power cords instead of 10 ft MVP cords and the TIG amperage range and duty cycle are a bit higher. 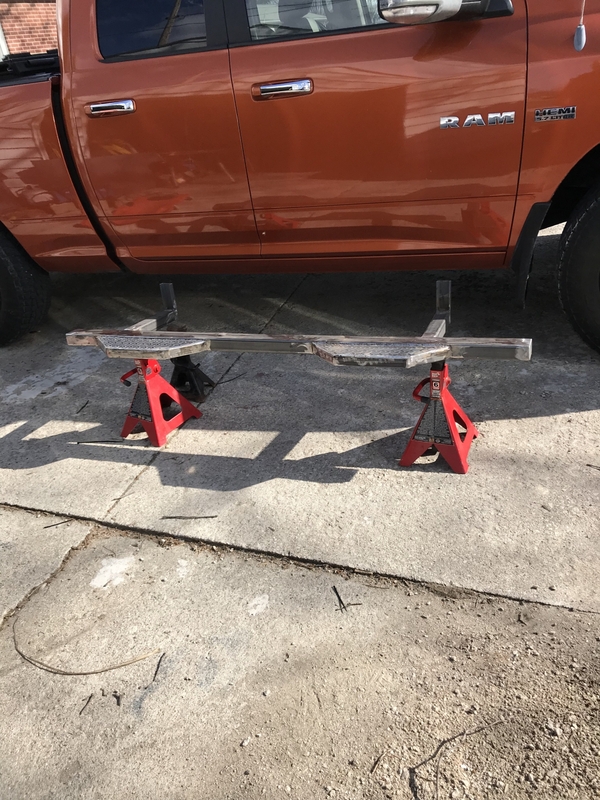 Works great, I have not been disappointed by any Miller products. welder and use the same bottle,saving space. Compact yet very powerful. Have only ran on 110v 220 should be even better. Buy a good 10-2 extension cord if you need it movable power cord not too long. Leads fairly short. Burned thru two pounds on 3/32 7018 only issue was negative voltage error13.4 just unplugged and it reset. First welder purchased, did order gas lens for tig and different collets. All in all only used two weeks seems like high quality product.